A Saudi prince has already snapped up the tower’s penthouse. Whatever next for the Arabian city that has an artificial ski slope covered in snow even when the temperature hits 50C? Not to mention the world’s tallest building, some 700 metres (2,300 ft) high, rising above palm-shaped artificial archipelagos in the warm waters of the Persian Gulf. Oh, and a growth rate of 16% and a population where foreigners in need of “luxury” homes outnumber locals. 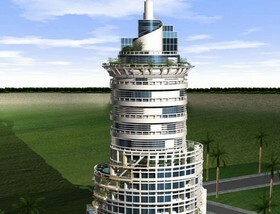 Well, what about the world’s first rotating skyscraper? Mr Cooper is not referring to “fair” as in “funfair” – though the building is, it has to be said, the spectacular proposed centrepiece of the giant City of Arabia amusement park, complete with animatronic dinosaurs, which is due to open in 2009. Will it work? Cooper has previously designed the drilling machine that bored for England and France beneath the Channel, allowing Eurostar trains to race between London and Paris. He has also designed a giant rotating rock-crushing machines for use in mines. Getting a 30-storey building to turn slowly should be a doddle. And, Cooper claims, the power required to make it spin should be no more than is needed to boil 21 electric kettles. Rotating parts of buildings is nothing new: London’s Post Office tower, featuring one of the world’s first rotating restaurants (with a very British catering service ,provided by Butlins), opened in 1966. But, this side of an observatory, getting a whole building to turn around its axis is something else – a case of a “white hot” sixties technological dream realised in a blazing hot emirate half a century on. The £41m building is designed by British architects at Glenn Howells Associates, the company currently converting the Birmingham Rotunda into a block of 230 flats, and the Dubai city developers Palmer and Turner. It will be capped with a crescent-shaped Moon Lounge, which will feature a theatre and an observatory. From here, future residents may just be able to catch glimpses of the further 23 rotating towers the Dubai Property Ring plans to build in cities around the world – one for every time zone. The idea is enough to make anyone dizzy.